What Happens If I'm Approved for both FERS Disability and SSDI? If you are a federal or postal worker with a serious medical condition, you may be entitled to FERS Disability Retirement (FDR), Social Security Disability Insurance (SSDI), or both. 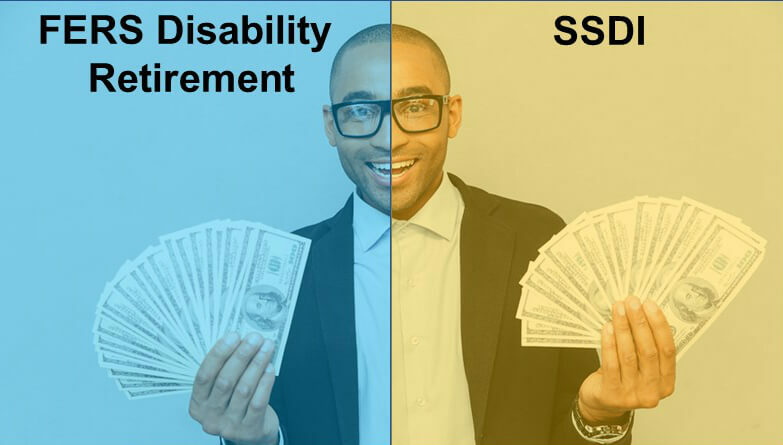 In fact, if you are applying for FDR, the Office of Personnel Management (OPM) requires you to apply for SSDI. But what happens if you are approved for both FDR and SSDI? If you are under age 62 and your [FDR] annuity benefits were computed using either 60% or 40% of your high-3 average salary, the Office of Personnel Management will reduce your monthly annuity by all or a portion of your Social Security benefits. While you are receiving an annuity computed using the 60% computation, OPM must reduce your monthly annuity by 100% of any Social Security disability benefit to which you are entitled. While you are receiving an annuity computed using the 40% computation, your monthly annuity will be reduced by 60% of any Social security disability benefit to which you are entitled. This reduction only applies for months in which you are concurrently entitled to both FERS and Social Security benefits [emphasis added]. To illustrate, let’s take a look at some examples. Note that this amount is equivalent to Jane’s non-reduced FDR annuity at the 60% computation. In October, Jane receives her FDR annuity at the 40% computation, but she is no longer receiving SSDI. Therefore, Jane’s total monthly annuity is $1,500 (as computed in Example 3). When you receive both FDR 60% and SSDI, it’s a wash. In other words, it’s the equivalent of only receiving FDR 60%. Therefore, during your first year of FDR, there is no added financial benefit to receiving SSDI (unless your monthly SSDI payment exceeds your monthly FDR payment). However, when you start receiving FDR 40% and SSDI concurrently, you end up getting more money than if you just had FDR 40% alone, because it’s the equivalent of receiving FDR 40% + 40% of your SSDI benefits. To get a solid idea of what your monthly income would be if you were approved for both FDR and SSDI, ask your agency for a “FERS Benefits Estimate” and request a copy of “Your Social Security Statement” from the Social Security Administration. I hope you find this information helpful. For similar topics, please visit my Blog and FAQ. Should you ever have questions about your eligibility for FERS Disability Retirement, please contact me to schedule your free 30-minute consultation! FERS Disability Retirement: Am I Entitled to Severance Pay? Will OPM Approve My Disability Claim Without a Physician’s Statement?